We see it everyday, but don’t really think about it much – Singapore is always in the constant state of change. It is only when we zoom out to a more macro perspective that the gravity of how much an entire country can change in the span of a short period of time hits us. Since 2013, Google has been releasing timelapses from the satellite views of earth as seen through Google Earth. Through this, we have had the opportunity to watch the world transform on our screens, all of which have happened while we were growing up, and not knowing what’s happening out in the world. For the most part, we get to marvel at how fast major cities around the world change and grow throughout the 21st century. Road networks get more complex, bridges are built, and buildings get taller. This is how much San Francisco has changed in three decades. Unsurprisingly, the most change tends to come out of Asia. With globalisation as a driving force in modernising the traditional Asian landscape, the tale of backwater villages and towns being turned into mega cities within the last 30 years is a commonly recurring theme. Here we have a look at how Dalian has transformed. Unfortunately, Singapore didn’t quite make the cut to be a featured image on Google’s blog post. But as always, the good thing about Google is that they are not stingy with their maps. On the interactive Google Earth map, you can navigate to any corner of the Earth and watch how the terrain has changed in the last 22 years. So of course, we turned our sights to Singapore, and this is what we found. Singapore is a country whose land mass has significantly increased in the last 22 years. 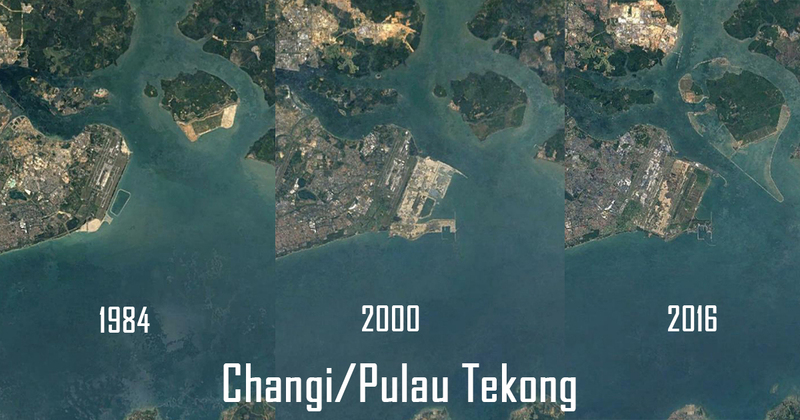 From the island of Pulau Tekong, all the way down the southern shores of Singapore, land reclamation has been profound, and the density of buildings in the country has also increased by a lot. Look around, though, and you will see that our neighbours Malaysia and Indonesia are pretty much clearing forests all in the name of progress. This is sadly a common occurrence worldwide, and Google Earth has made it worryingly simple for us to see how the human race has ravaged mother Earth. Looking at how cities change and grow only seeks to deflect the actual problems that we are supposed to deal with in the world. Our progress has come at a price, and it is one that may soon be irreversible. Sights like these in Bolivia are very common in developing nations. with entire forests being cleared for the sake of farmland and industrial use. Popular Science has gone even deeper by seeking out coastal towns and cities on Google Earth and have found that as compared to 22 years ago, the sea levels have been rising, and marshes and swamps are being flooded already. They also looked at our ice caps, and the findings are quite worrisome, with the glaciers of Alaska showing clear signs of receding. If you’d like to check out the effects of climate change for yourself, head on over to the Google Earth Engine here, and read up on their blog post while you’re at it.